eD@HoMe: My first Slovenian cover! Many thanks to Roman Hudmal for presenting my first cover from Slovenia! 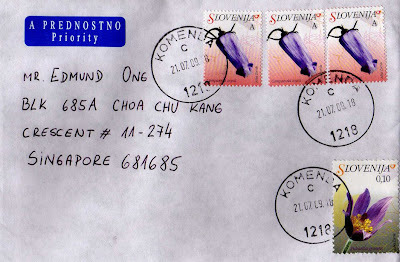 The beautiful stamps franked on this cover belong to "Flowers of Slovenia" definitive series, issued on 1st January 2007. 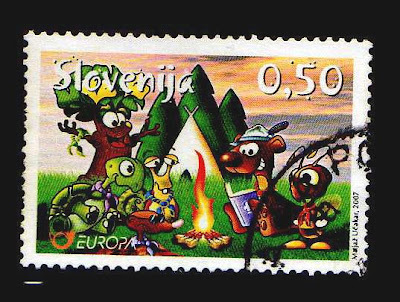 It is Slovenia's first-ever euro stamps. The stamps feature 17 plant species of European importance native to Slovenia and they depict Zois' Bellflower (A rate - Domestic Standard Letter), Yellow Lady's Slipper (B rate - Domestic, up to 20g), Saw-wort (C rate - International Standard Letter), Primorska Whin (D rate - International, up to 20g), Spleen Wort (€0,01), Tommasini's Sandwort (€0,02), Adriatic Lizard Orchid (€0,05), Pasque Flower (€0,10), Carniolan Primrose (€0,20), Marsh Gladiolus (€0,25), Dineric Chickweed (€0,35), Lily of Ladybells (€0,48), Bertolini Columbine (€0,50), Fen Orchid (€0,75), Meadow Squill (€0,92), Alpine Eryngo (€1,00) & Yellow Azalea (€2,00). 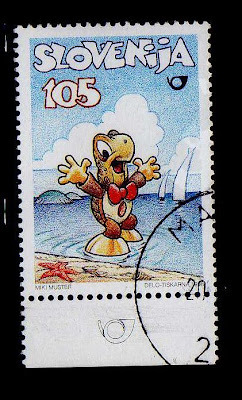 In addition, Roman was very kind to send me a number of Turtles stamps and here are 2 of my favourites. Thanks again Roman!